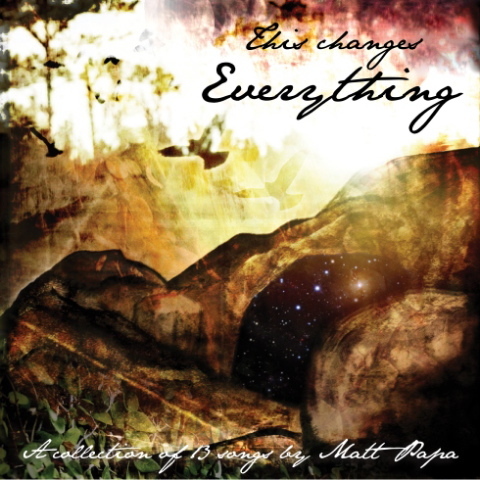 Matt Papa Album Review: "This Changes Everything"
When I was in the 10th grade, a friend of mine named Joshua White challenged me to stop listening to secular music altogether. He swore it would help my attitude and wordly disposition. I swore he was crazy. He soon backed off of his suggestion and realized it was maybe too much. But something in that got into my head. I decided to give it a try, for the most part. I didn’t last long. But what did happen was I began to listen to Christian music probably 90% of the time, EVENTUALLY (definitely not immediately) finding favorites in DC*B, Lecrae, Matt Redman, Sovereign Grace Music, Hillsong United- of course!, Gungor, John Mark MacMillan Tenth Avenue North and others of the sort (especially those of the Passion movement). That same year I went to a Strength To Stand conference. 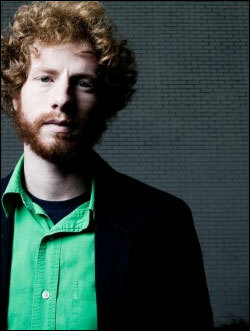 While there, we had this worship leader named Matt Papa. He was a wiry haired, energetic guy. His lyrics threw me off and I did not leave as a fan. How dare he have a lyric hating on the American Dream in his “Here Am I, Send Me” song! The young, Christian, Republican I was trying to meet every southern Christian stereotype possible did not like him much at all. He didn’t sing the same trite, emotion based lyrics of the bands I loved at the time. His lyrics made me think, and in doing so my trite, emotion based faith found his songs distasteful. Then I discovered, rediscovered, and began to dig into the depths of the gospel. Then I became a fan. And now here I am, reviewing an album by Matt Papa. And I am a fan– a big one. This CD is something the Christian public needs, badly. I’m not so sure I would label it a worship CD. Nor would I put it in the JMM “deep thoughts for Jesus” genre. I once heard Lecrae described as a ‘sermon put to a deep bass beat’. I think that is kinda where I would place Matt except it’s more like ‘a gospel exalting, Christ centered reflection set to a rock album with the ingenuity of Queen, the theology of Spurgeon, and the poetry of John Bunyan.’ Maybe that’s a bit much. Let’s get to the songs themselves, shall we? I’ll hit the top 3 for the sake of time, then a highlight of the top 10 single line lyrics for everyone before concluding. But first, this little bit in red from Matt himself about the album. The year was 1514, and the earth was the center of it all. Until Nicolas Copernicus changed everything. It’s called the “Copernican Revolution” for a reason. Everyone believed the sun, and everything else, revolved around the earth. Everyone was wrong. And as the Sun took it’s rightful place at the center of the great Milky Way, a greater fear and reverence swept over all mankind; as for the first time man doubted his centrality in the universe. For the first time, humanity came trembling to grips with the humbling and earth-shattering reality: we are small. My prayer for you is that as these songs bring you into collision with the greatest, most central reality in the universe, namely the Gospel, that a copernican revolution would be unleashed in your life. All of us come into this world bent on believing that we are at the center. But we’re not. There is, however, a Reality holding steady at the center of it all, beckoning us to open our eyes and see what we were made for. His name is Jesus. And He is the center. He will not be a part of your life, one of the many orbiting obligations around you. He will be your life; the star you revolve around or nothing at all. The tomb is empty and He is Lord. This changes everything. Who can escape, His all-searching eyes? Glorious, Great! O, none is His equal! I mean, CMON! That’s pretty epic, right? Dude is literally singing a song extolling the fact that God is holy, holy, holy— unapproachable on our own merit, free to do as he pleases, and all powerful in such a way that we should quake at the thought of him. That’s legit! People just don’t do that! And they definitely don’t do it to tune of a wailing guitar and heavy drums. Matt does. Then Matt does the oddest thing- most are going to go on and say how they did it and how we are all gonna go crazy missional and sold out for Jesus. Matt instead goes more of the Pauline “test yourselves and make sure you’re in the faith” route. He asks if he’s become “too comfortable with amazing grace, too familiar with an empty grave. || Did I miss something, have I begun to lie? Do I really live like Jesus is alive?” It’s a powerful thought. One the church needs. He then concludes that YES! This is true! We must live this way! This song is both an indictment on and an encouragement to the church. But most of all, it’s a gift! It’s a song the church so desperately needs, one that exalts God and questions our own self-assured security in a salvation that doesn’t demand us to act. Thank you for this song, Matt. The last song I really would like to focus on is “What Are We Waiting For”. This song is truly an ode to the true Great Commission of Jesus Christ, and the urgency thereof if we really believe it! From up above, is not His word enough? 1) The urgency of the gospel and calling of all to GO! 2) Much of today’s Christianity as less likely to rely on Scripture as not only their guide but also command and marching orders, instead opting for some ethereal message in the sky. 3) The danger of becoming the “people demanding a sign” that Jesus spoke of instead of those trusting in the sign of Jonah. -This song is good for all of those things. If we truly trust the Gospel, we MUST go! Or, as Matt closes the song “If we love him, we will keep his Word. If we know him, we will tell the world!” Papa is not making mission a necessity of salvation but emphasizing it as a true outpouring of affection for our slain and risen Lord in this song! What can be more worshipful than acknowledging what Christ has done for us in the world and then obeying him? I think nothing. This songs lifts that thought high, and in doing so lifts God in Christ high, as we all ought! It was hard for me not to simply do a 13 part series on each and every song in this album. I literally love every song except maybe 2, and I don’t dislike them. Ok, I love them all. You got me. So instead of making this even more obnoxiously long that it need be, I have decided to do a top 10. So here it is…. “Did I miss something? Was I not supposed to cry? Did they hear the preacher, “Jesus is alive”? Shai-Linn raps on the song “The Lord is a Warrior.” It’s insanely awesome. Not quoting it here. I understand that that’s a lot. Thanks for reading this. It is probably impossible for you to grasp all this in your head. The hum of your computer is nowhere near as awesome as the background music these lyrics deserve. There’s no way I would write this thorough a review and analysis for almost any of the CDs on my iTunes (over 4500 songs!) But something about this one stirs my affections towards Christ and pushes me to share the Gospel while resting in it constantly. So……. When the album releases on AUGUST 2, 2011!!!!!!!!!!!!! !, go buy it. Seriously. I hate excessive exclamation points, and I just did it. So you should buy the album and worship. I am. Then go sponsor a Compassion child. Then go take the Gospel to yourself. Then take it to your neighbor. Then take it to the nations.